Our Most Popular Residential Fabric…..
Sunbrella fabrics are the most popular choice for any residential home awning selection. Sunbrella fabrics are solution-dyed woven acrylic, available in many color options. Sunbrella fabrics are highly water-resistant, and designed to last for years in direct sunlight. From traditional solids and stripes to contemporary variations of designer hues, you can select a fabric to suit your home’s exterior. Country Canvas only offers the finest quality fabrics to our customers. Sunbrella has been the fabric of choice for many customers, and our experienced staff will help you through the process of choosing the right color and style of awning. Give us a call at 724.228.2707 to get started! Country Canvas offers several vinyl fabric options popular mostly for commercial applications. 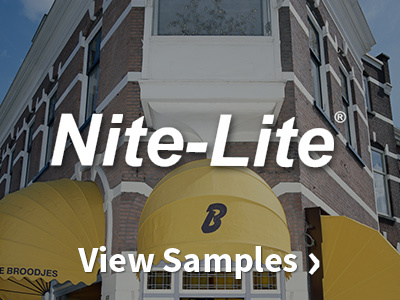 Two of our most popular are Coastline Plus and Nite Lite. 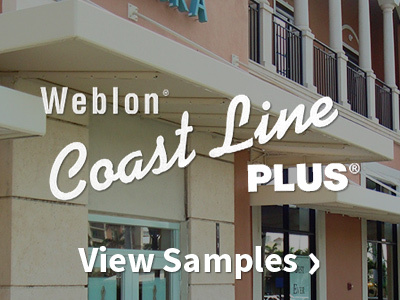 Coastline Plus fabrics are an excellent choice for commercial awnings. The top surface is treated with the Rain Kleen® finish for color retention and prolonged fabric life. Coastline Plus is also flame retardant in addition to UV, water and mildew resistant. They are made from a vinyl-coated polyester, known for their durability and resistance to fading and shrinking. These vinyls easily accept all kinds of graphics. Nite Lite: This fabric gives off a beautiful glow when lit from underneath. Nite-Lite is an exceptional back-lit fabric that features vivid colors with a translucent white underside for spectacular illumination.